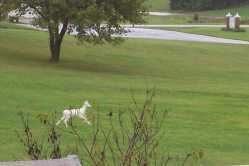 This white "albino" deer was seen running through our field just off Old Hopper Road on Sat. Sept. 20 at 8:30 AM. It was with the other group of 4 deer. (We saw this same white deer again last night, Sept. 22, across Old Hopper with a group of 8 other deer). A sight to behold! Hard to tell in the photograph but there are many more white deer than very rare albino deer. a closer look will confirm which really is. totally awesome though.